Quite an unsettling trend has developed through the first four Pirate games: good game, bad game; good game, bad game. Being that they had 17 hits last night, that means today was due to be a "bad day", so we then shouldn't be surprised that the Buccos would get a total of one hit in a 2-1 loss in St. Louis. Cardinals pitcher Chris Carpenter took a no-no into the seventh inning, but Ramon Vazquez would have none of that, singling under 2B Skip Schumacher's glove with two outs in the seventh. 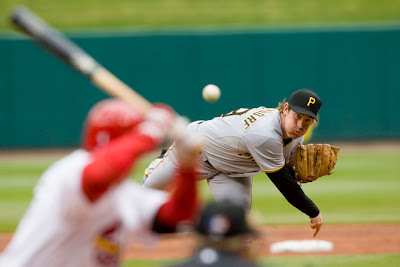 The Pirates went three-up-and-three down in five of the first six innings, managing an unearned run in the third for their only run of the contest. There were no extra-base hits by either team, so I hope the 35,293 in attendance liked pitching. On the positive side, Ross "Mr. Wonderful" Ohlendorf was OK, surrendering two runs and seven hits over six innings. But beyond that, there obviously wasn't much to write home about for the Buccos on this day. That being said, leaving St. Louis with two wins would probably be considered an acceptable scenario for the opening series. Next up for your Buccos: the Cincinnati Reds, sans Adam Dunn and Ken Griffey Jr. , for a three-game set. The teams will match up tomorrow night in The City of Ocho Cinco at 7:10 PM, with Jeff Karstens starting opposite the always-dangerous Johnny Cueto. No shame in getting shut down by a dominating pitcher like Carpenter. Reports sound like he is healthy and may be close to the pitcher he was when he won the Cy Young. Been a long road back for him. Hey, if they went "good game, bad game, good game, bad game" all season, they'd top last year's win total by 15 games. Hey, so long as we don't end up in the cellar of the Central, it's not bad to lose to good pitching; the counter to that is we need to have our pitching show up every game, not just for fireworks or bobblehead giveaways.